Tabs Studio is a Visual Studio and SQL Server Management Studio add-in that organizes document tabs and cuts software development time. Tabs Studio lets you group your document tabs intelligently, and makes all of your document tabs visible by creating multiple rows of tabs. When working on large solutions with 20 or even 30 tabs open at the same time, it can be frustrating finding documents that are already open. Tabs Studio lets you immediately switch to another tab with a single mouse click or a few keyboard shortcuts. Using regular expressions, Tabs Studio offers complete control over title-based and path-based grouping of tabs. By keeping your h/cpp, xaml/xaml.cs, and aspx/aspx.vb file pairs in the same tab, you'll never waste time again looking for the tab that you need next. Tabs Studio takes this concept one step further: If you're modifying Model, the software lets you group all four files - Model.cpp, Model.h, ModelTest.cpp, and ModelTest.h - under a single tab. It's easy to remove the path from a tab name, and to color-code your tabs meaningfully. Instead of displaying tabs in multiple rows, you can show them vertically in a separate tool window. Tabs Studio is designed to optimize software developers' time. For example, it's easy to selectively close a code file without first activating the tab. Tabs Studio is an XAML-based WPF control, and it allows you to use BasedOn styling to completely control the behavior and presentation of all of your tabs. Whether you're an application development project manager who needs an affordable way to reduce the team's development time, a database administrator who needs to make it more efficient to work with more than a handful of open tabs in SQL Server Management Studio, or a software developer who wants to stop wasting time searching for document tabs, Tabs Studio has the tools that you need. Tabs Studio runs under Windows 10/8.1/7, and works with Visual Studio 2019/2017/2015/2013/2012/2010/2008 and SQL Server Management Studio 18/17/2016/2014/2012. A single-user license costs $49(US). Multi-user discounts are available, providing an affordable way to automate the entire development project team. 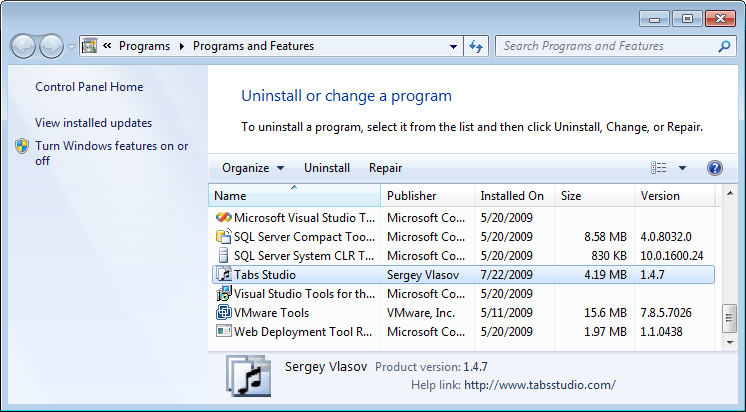 The Tabs Studio installer installs the Tabs Studio add-in for the current user for all supported Visual Studio and SSMS versions present on the computer. The installation doesn't require admin rights or elevation. Each Visual Studio or SSMS version needed to be run at least once before Tabs Studio installation. If your Documents folder on a network share, enable the loadFromRemoteSources switch in devenv.exe.config. For errors updating Tabs Studio see Error writing to file (Error 1310). When installing Tabs Studio on a Windows Server, you may get the "The system administrator has set policies to prevent this installation" error, in this case execute the installer from a command prompt running as administrator. To install Tabs Studio in a different directory use the INSTALLLOCATION command line parameter. A single tab can represent single or multiple Visual Studio windows. Left click on an extension in a tab group to switch to the window with highlighted extension. Middle click on a tab or on an extension in a tab group to close the associated window. Right click to open context menu. Drag a tab with a mouse to change tab position relative to other tabs. To place a moving tab after another tab, drop it on the right half of the target tab. To place a moving tab before another tab, drop it on the left half of the target tab. A tab name can contain a path to a file (e.g. App_Code/Class1.cs) when working on ASP.NET web sites in VS 2010. When the Remove path from tab name option is checked - path is removed. Instead of standard tabs position at the top of a code window, the Show tabs in a separate window option moves tabs to a separate Visual Studio tool window which you can resize and position any way you like. The TabsStudio.Connect.ShowTabsWindow command and the corresponding toolbar button make this tool window visible. The Vertical tabs layout places tabs in a single vertical stack and is useful when having separate tabs window on a side of a code window. You can export and import Tabs Studio settings (with the corresponding buttons) for backup purposes and to copy Tabs Studio settings to another computer. 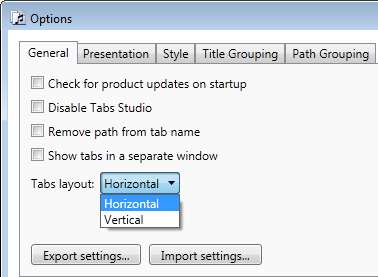 Tabs Studio keeps separate settings for VS 2012+, VS 2010, SSMS 2016+, SSMS 2012/2014. If you use several products, export saves all settings and an additional dialog on import lets you select which settings you want to import. Exported settings are stored in a .tssettings zip file and mirror the raw settings directory structure. Presentation and style options let you customize visual representation of tabs. See the dedicated Style page for more information. create super groups of tabs. See the dedicated Tab grouping page for more information. Several add-ins are available for Tabs Studio. You can also develop your own add-ins in any .NET language using Tabs Studio extensibility infrastructure. See the dedicated Add-ins page for more information. The Navigator add-in adds more commands. You can open this dialog from a tab context menu Tabs Studio - Registration or from the About Tabs Studio dialog. To delete the Tabs Studio toolbar in SQL Server Management Studio go to the Tools menu - Customize - select Tabs Studio toolbar - Delete.